I thought I hated mules, then I saw the gorgeous 'It' mules of the season by Vince. They were a little architectural, offered a variety of textures, and looked pleasantly fresh. However the price point was way outside my range, specially for a seemingly trendy shoe. So my hunt to find a more budget-friendly began, and promptly ended when I stumbled upon these beauties at Kohls. They're real leather, super comfy, and pair with a shocking amount of other items in my closet. I haven't shopped at Kohl's for awhile, didn't know Shoemint had a line there. 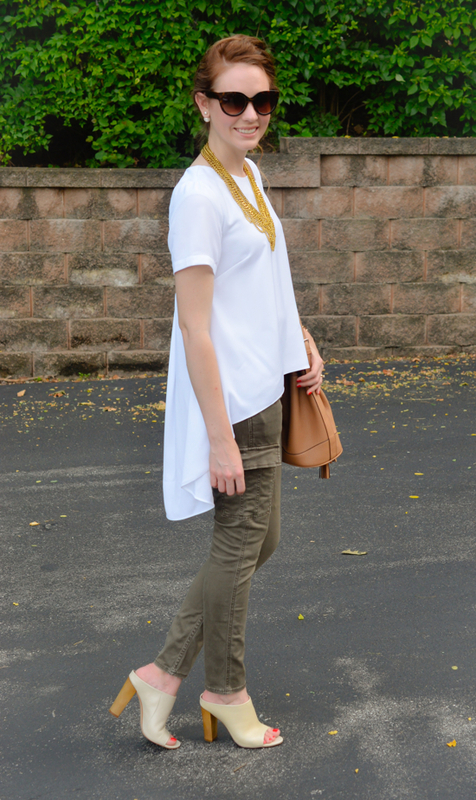 Great outfit - loving the high low hem of your top. OBSESSED with this outfit! SO perfect! love the high low top! so stylish head to toe! love it! thank you for hosting this link up! This is such a cool look! Love you high/low top! Those mules are fabulous, and the ones at Kohl's are almost identical to those pricey Vince ones. Good job! I also adore those pants. 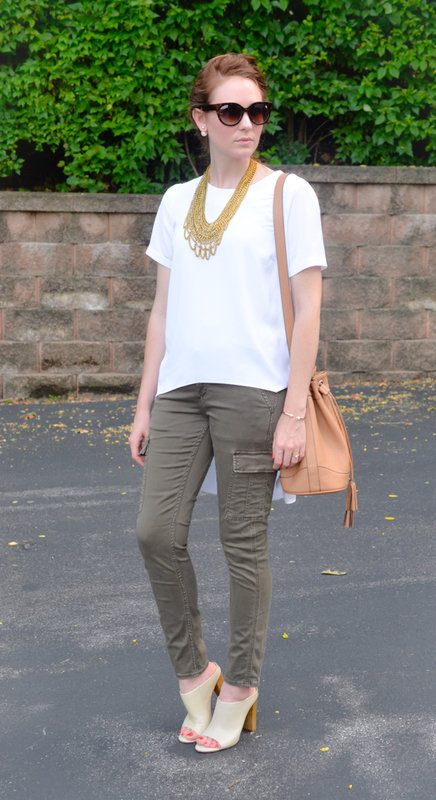 I love the mule sandals paired with khaki. LOVE this outfit! Those pants look amazing on you! I've always steered away from mules as well but you are making me re-think that - they look adorable. Your hair is gorgeous up like that! I am absolutely in love with this outfit! The mules are killer. And your dog is such a sweetie...I often get doggie photobombs too! I'm loving the combination of the skinny jeans with the loose top. Great silhouette! I love this look! Those pants add an unexpected edge to the look! Now that dog is the cutest! love those pants! fun color! Very cool outfit! I'm absolutely loving your top! Thanks 4 linking up 2 Top of the World Style. 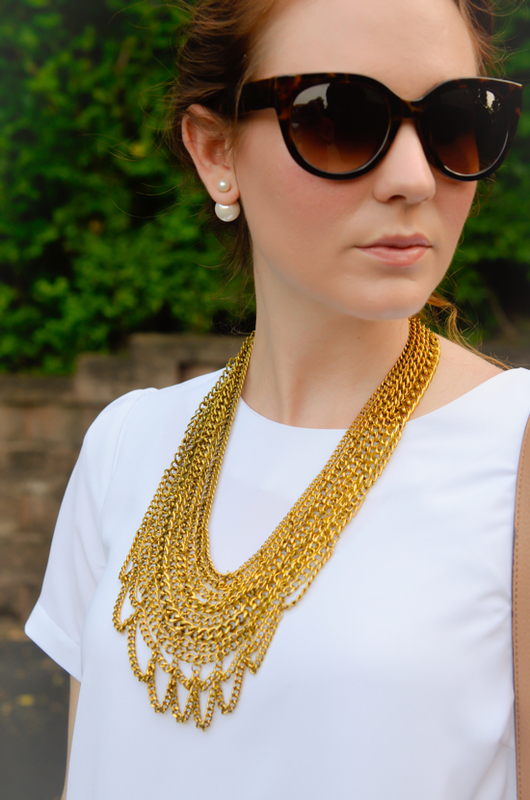 Your necklace is a stunner! I love your look! 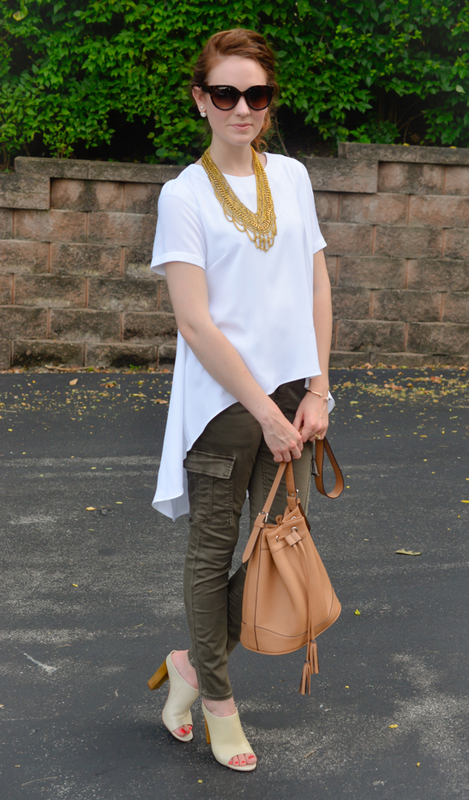 The flowey white top with the army green colored pants and gold necklace is adorable. And you pouchy is too! 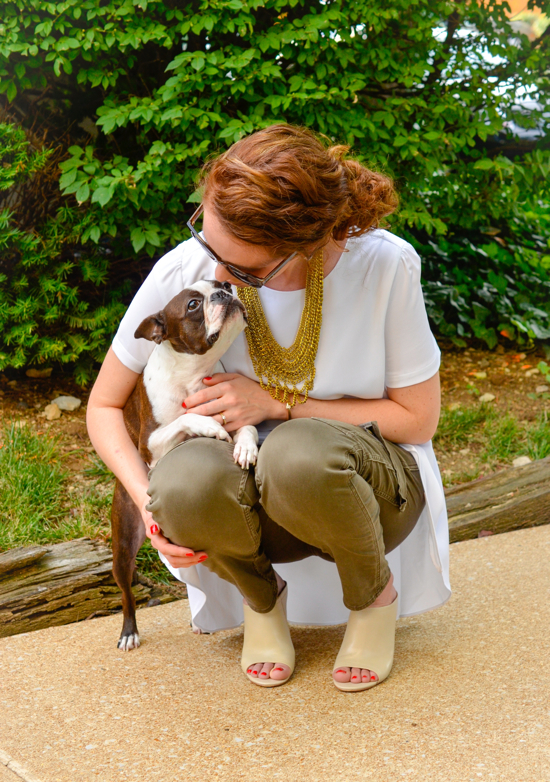 Grew up with Boston Terriers. Thank you for hosting. Great look! I love that unique shirt and those mules are fabulous! 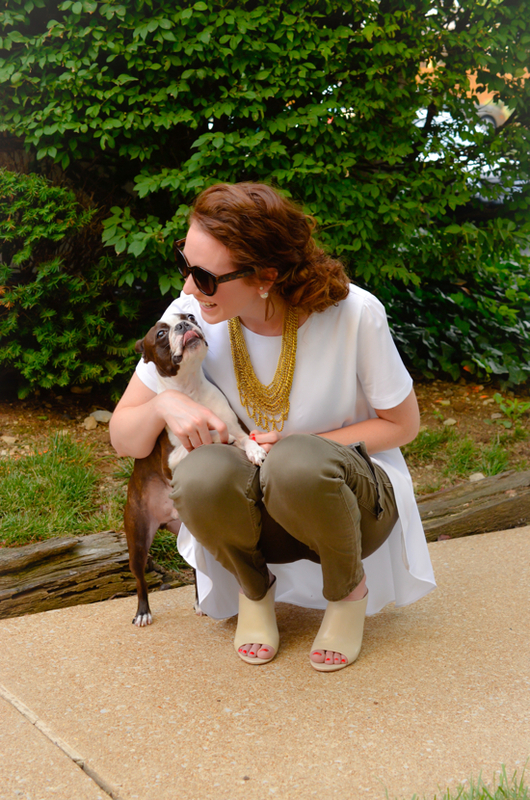 I love those pants, and your dog is too cute!